Comic book fans might not have a lot of experience with eye beams or metal skeletons, but the feeling of being different from everyone else is something they often understand just fine. The X-Men comics are unique in the Marvel Universe, as the characters' abilities - born of genetic mutations rather than cosmic rays or super-serums - inspire fear and hatred from regular people, rather than awe and admiration. The X-Men are outsiders, through no fault of their own, something with which fans can easily identify. In Issue 295 of The Escapist, Susan Arendt talks about how the X-Men made her feel better about being different from other people, just when she needed it the most. My exposure to the X-Men comics came at a transitional time in my life. I had recently graduated college and just started my first job. I had always known that I didn't fit in, but I'd never really understood why. I spent my entire education, up through college, trying to copy my peers, in the hopes that I would accidentally find the secret formula to acceptance. I wore what they wore, I watched what they watched, I went where they went. But somehow they always knew I was faking it. Now that I was out of that environment, mingling with people who hadn't been with each other every day since they were 8, I began to finally understand my problem: I was weird. Instead of caring about professional football and makeup and movie stars and beer, I liked comic books and Doctor Who and fantasy novels and videogames. I never fit in because I was wired differently; I could no more become like them than I could change my species. I spent a great deal of time considering the X-Men and how they protected a population that would just as soon see them dead. I read Mystique's description of how she was harassed because she was different, and I recognized her frustration. 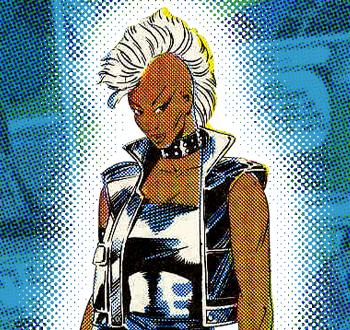 I saw Storm's apparently endless reserve of inner peace, and wondered how I could emulate it. I saw nobility and selflessness in the heroism of the X-Men, and I saw lonely bitterness in The Brotherhood of Mutants. Finally, here was something I understood. Besides providing her heroes - and villains - she could identify with, the X-Men comics also gave Arendt genuine proof that there were other people like her in the world. You can read more about it in her article, "Gifted Youngster."